Q . What is the Wise Use of Wetlands? A . People have used wetlands in various ways for a long time, and they have sometimes spent the gifts of wetlands very quickly. For example, when a wetland becomes a landfill to make crop fields or a town, or dries up because of using a large amount of water at one time, they cannot receive the gifts from the wetland from then on. The same holds for the case where people catch too many animals and plants in wetlands or they destroy their habitats. There is a way to keep using wetlands, whereby animals and plants can also live in their natural environment. We call it the "wise use of wetlands". It is important not to destroy the nature in wetlands and that we make plans and rules on how to use the wetlands before we use water, catch animals and plants, and develop the land. It is also important to keep an eye on the natural environment of wetlands and to check whether there are some bad changes caused by human beings. In order to promote the wise use, the Ramsar Convention encourages the countries joining the convention to make "nature reserves" in wetlands, to prevent unplanned development and use, and to develop people with the capabilities of managing the whole wetlands including sanctuaries and doing research. A new type of travel called "eco-tour" has recently been noted as a way of wetland "wise use". It is the way which is designed to enjoy nature every year so that visitors will not damage nature, or frighten living things. They can learn how to observe nature and how to enjoy wetlands from local people who live with the wetlands and know the wetlands best. As a result, those who join an eco-tour can appreciate the splendor of nature in the wetlands, and local people who were concerned with the eco-tour can use the wetlands as a work place. Those who join an ecotour and learn the importance of nature in the wetlands will be able to think about what they can do to conserve wetlands in their daily lives afterwards. Local people, who work for eco-tours using nature in the wetlands, will have to take better care of nature than ever. The purpose of eco-tours is to gain an income from wetlands without damaging nature in the wetlands, instead of taking all gifts from wetlands by development, etc. 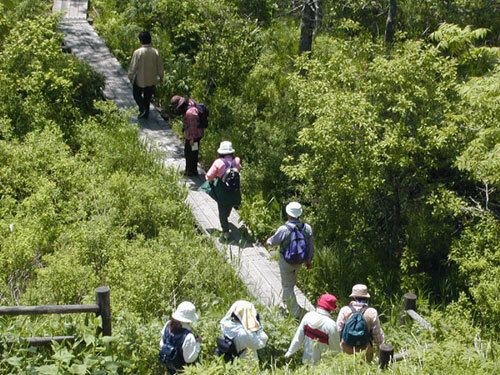 The Kushiro International Wetland Centre is engaged in activities to widely spread the idea of eco-tours to the world, especially in developing countries.